This CD carries the most important exercises from William’s groundbreaking book on personal development, healthcare and healing The Endorphin Effect. 6. Holding and Supporting a Group (4 minutes) – Builds on the EE to create a personal magnetism that makes people feel encouraged and secure. Endorphins are the hormones that relax tissue, remove pain, and create the physical sensations of wellbeing. They support physical and psychological health. The tracks guide you easily through the precise procedures for triggering these ‘miracle’ hormones of wellbeing and for absorbing health-giving vitality. This will help you feel good and deliver your best. These are eyes-shut exercises to be done in a situation where you can relax. 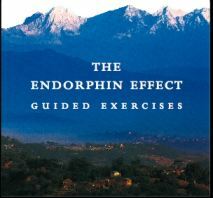 This Endorphin Effect CD embodies the core strategies of effective and accessible mind-body healthcare. It combines the essence of the traditional eastern and holistic approaches – mindfulness and body awareness – with the insights of modern psychology and neuroscience. ‘Thank you for your wonderful Endorphin Effect CD. I bought this last year and have almost worn it out from a lot of regular playing since then! It’s helped me through some challenging times too. (I think the absence of background music helps make it so durable for repeated use, compared with other meditation and hypnosis cd’s I’ve tried).